Welcome to our Infant Program!!! 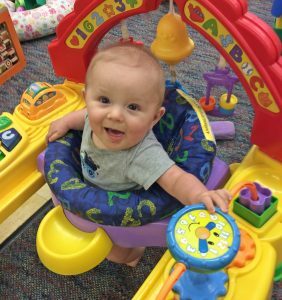 NDNCC provides full-time infant care for children starting at the age of 6 weeks. Our focus is on meeting the special and individual needs of each infant. 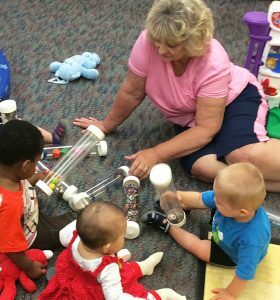 We build strong nurturing relationships with infants and their families by creating routines, learning differences and embracing individuality. Our trained teachers grasp the significance of your baby’s first year of life. We work together as a team to meet the needs of each child, creating an environment for constant learning. Consistent, nurturing relationships with the same staff members, including primary ones, early in life and throughout childhood are the stepping stones of both social-emotional and intellectual growth. On a daily basis, our children have a multitude of learning opportunities from sensory exploration, to quiet book time, to “tummy time”, to musical experimentation. Many of the children have learned some basic American Sign Language by the time he/she “graduates” to the Tweenie room. Visitors and staff members alike particularly enjoy watching the little people enjoy splashing in the water table, painting with their feet, crawling through the clear tunnel and “dancing” with scarves. We complete individual daily infant grams which communicate to families their child’s health, nutrition, sleeping habits, feelings and learning experiences of the day. We utilize the Teaching Strategies Gold assessment tool to help our staff and parents/guardian monitor the children’s development together, and offer conferences to discuss these developmental assessments. All Infants are on her /his own feeding schedule which changes as he/she grows and starts eating solid food. Infants not yet eating table food will be served cereals and jarred foods provided by NDNCC. We ask parents to bring ready to drink bottles. Please come for a visit and share the experience with our infants!